What? With search engines’ frequent algorithm updates, the phrase “content is king” is becoming more valid than ever before in the SEO industry. People are starting to realize the importance of creating new, unique, relevant and sharable content on their websites. Why? When someone conducts a search and lands on your website, they want the information provided on the site to be relevant to what they were searching for. They want to quickly read about your business or product and decide whether or not it is what they are looking for. If the content is useful and interesting, the guest may be excited to share this information with family and friends. With the many new ways to share information online – Facebook, Twitter, blogs, Google +1, etc., it’s important to create content on your site that visitors want to share. This not only brings more attention to your website, but the search engines also notice when people are linking to your website and sharing information about your business, and they see this as a referral to your site. So we know that content is important, but how do we create shareable content? Think about what content will be most relevant to your target audience and try to answer their questions and meet their query. 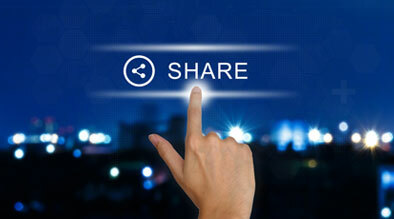 For those who have a current website, where is the best place to find shareable content? The best content to share is usually the pages that are updated most often and the most popular pages – but there are many other opportunities throughout a website to find great content. Look through your website and find a sentence or two that you can turn into a keyword-rich social media post – and make sure to link back to the page from Facebook or other social media channels. Email Offers page – encouraging guests to sign up for more! Conclusion: We have an opportunity through search and social media channels to market our businesses and products and bring attention to the valuable information available on our websites. Take advantage of this marketing opportunity by reaching out to your audience with fresh, relevant and exciting information and make it be known that this great content can be found on your website!